EEI’s world-class Steel Fabrication Shop is one of the strengths of the company. Having existed for more than 30 years, EEI’s ISO 9001:2008 certified fabrication shop located in Bauan, Batangas is integral to the company’s comprehensive capability to fabricate and erect structures and assemblies for industrial installations and infrastructure projects. It has fabricated tanks, silos, pressure vessels, drums, heat exchangers, boiler parts and other intricate steel structures, and has assembled these together with pumps, motors, and instrumentation equipment for the country’s oil and gas facilities, power plants, food and beverage plants, breweries, sugar mills, and other manufacturing facilities. It exports steel structures and modules to the overseas market as well. The Steel Fabrication Facility, which has an annual rated production capacity of 30,000 metric tons, is equipped with some of the latest process tools and machines such as bending, rolling, and welding equipment. It is equipped as well with heat treatment ovens, blasting and painting lines, and has its own power sub-station, slipways, and jetty. In-house, non-destructive testing facilities and strict quality control procedures under ISO 9001 Certified Quality Assurance Program assures clients of the highest quality and customer satisfaction. The Fabrication Shop houses a modular assembly facility for the fabrication and assembly of plant modules. The assembly facility includes a customs-bonded manufacturing warehouse which allows duty-free entry of materials and tax-free export of finished assemblies. Over the years, it has assembled boilers, turbines, and power plant modules which were shipped in whole assemblies to clients in various parts of the globe. The EEI Fabrication shop has earned the distinction from the American Society of Mechanical Engineers the right to stamp the ASME seal in pressure vessels, pressure piping, and power boiler parts that it fabricates and assembles making it one of the leaders in the fabrication of mechanical and structural steel assemblies in the Philippines. 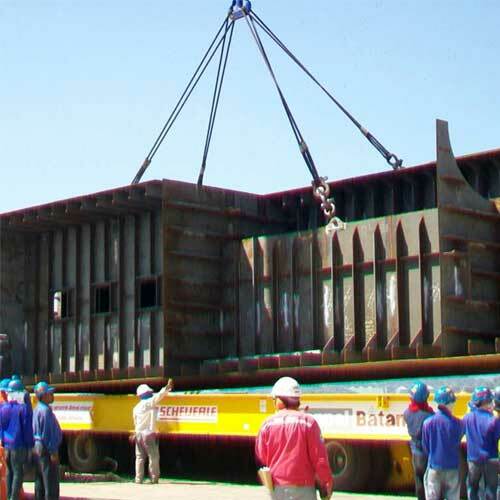 The EEI Steel Fabrication Division will be doing the fabrication and assembly of various blocks for the Bras Sete Projects of Keppel Batangas Shipyard, Inc. 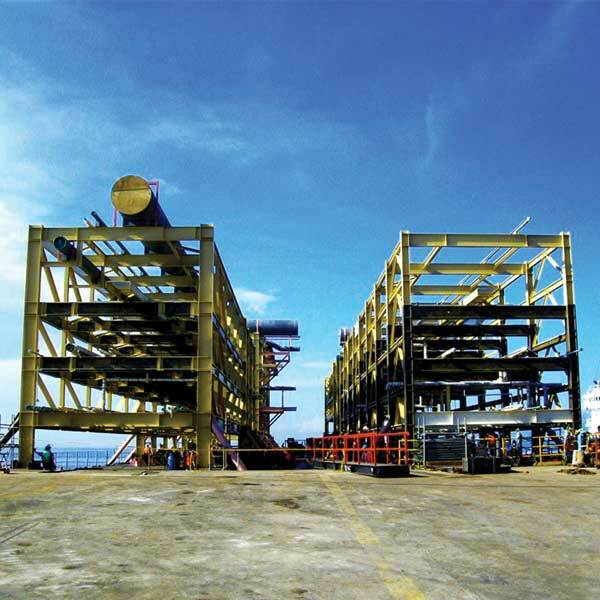 The Singapore Parallel Train Project was 28 units pipe rack module fabrication project worth $40 million for Shaw/Stone and Webster Asia Inc. (SWAI) intended for Exxon Mobil Asia Inc. Refinery expansion, located at Jurong Island, Singapore. Modules were fabricated in EEI Fabrication Shop in Bauan, Batangas. The project was started in September 2008 and was completed last September 2010. Right now, EEI is involved in the installation of pipe rack modules under the supervision of Shaw / SWAI in Singapore. 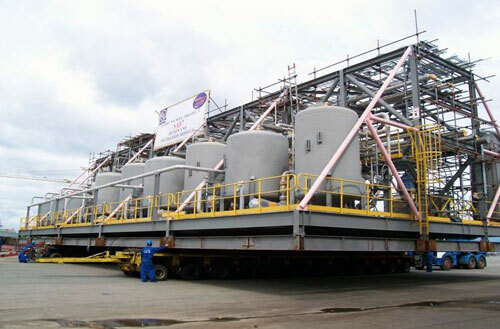 The Goro Nickel Project was a process equipment module fabrication and assembly intended for a nickel mining refinery plant, owned by Inco Australia Management Pty. Ltd. The subcontract amounted to $24 million, which was started on June 2005 and was completed on March 2008. The modules were fabricated in EEI Fabrication Shop in Bauan, Batangas and were shipped to New Caledonia.